In 1957, Rolex set about replacing their 1000 series of calibers. These were the first family of movements created entirely in-house by the manufacturer. It also introduced the next generation. Rather than launching the 1500 series in a great sweeping confusion across the board, they phased them in gradually over a number of years. These ran concurrently with the previous mechanisms in several models. They introduced Rolex Caliber 1520 and 1530 into this new wave. The Rolex Caliber 1530 was the first of the new wave. It was the base caliber upon which the rest of the range would be founded. As a movement, the 1530 represented a major reworking on its predecessor. This explained Rolex’s tiptoeing approach towards its introduction. There was a host of new technology that still had to prove its worth out in the real world. Rolex originally launched it as a 17-jewel movement. Additionally, it went through a number of significant upgrades itself during its successful run before retiring in 1965. Joining the first iteration, they also released it in 25 and 26 jewel versions. Its initial butterfly rotor graduated to the familiar half-moon type. Also, they replaced the brass colored gears with the red, Teflon-coated variety we generally see today. While extremely precise and reliable, they considered the Caliber 1530 very much a workhorse caliber. Therefore very few were submitted for chronometer certification. Instead, Rolex fitted the movement into several of their non-chronometer models, such as the Air-King and the earliest versions of the Submariner, watches they initially deemed not to need mechanisms that had passed the rigorous COSC tests. However, ask any watchmaker today what in their opinion is the best movement Rolex ever produced, and many will still say the Cal. 1530. Its lack of certification was down to its relative difficulty in regulating consistently rather than its overall accuracy. Before the innovation of Microstella screws were first introduced in 1959 on the Cal. 1565, the previous screw balance was far trickier to adjust, especially considering the volume of movements Rolex produce. A comparatively low frequency caliber—18,000bph instead of the standard 28,800bph of all modern day Rolexes—the Cal. 1565 produced a five beat per second tick rather than the smoothly sweeping eight. In 1963, in a curious and extremely un-Rolex-like move, the Cal. 1530 started its own process of being phased out. Rolex replaced it by the less advanced Cal. 1520. As the numbers suggest, it represented something of a backwards step for the usually progressive thinking company. It was centered on the same architecture as the Cal. 1530, and shared an identical base plate. However, it had several key differences, many of which were designed to keep its manufacturing costs to a minimum. Rolex only produced it with a stick regulator, rather than with the Microstella system that had found its way onto the departing 1530 by the end of its run. The Breguet overcoil of the majority of Rolex’s output was substituted for a traditional flat hairspring, and it was originally released as a 17-jewel movement, although 25 and 26-jewel versions joined the range later in the production cycle. However, even with all the cost cutting measures, the Rolex Caliber 1520 was still an impressive performer. Rolex never intended to submit it for chronometer certification. With the full weight of the company’s engineering legacy behind it, it provided the brand’s ‘Precision’ models with a beautifully built and highly accurate engine. Its increased frequency, 19,800bph up from the previous 18,000bph, gave it an extra boost in both timekeeping ability and resilience to shocks, and it remains a favorite among watch repairers for its workmanship and ease of maintenance. Along with its date function equipped counterpart, the Cal. 1525, the Rolex Caliber 1520 powered Rolex’s limited selection of non-chronometer watches until 1980. By then, all but the Air-King had gained the certification and the 3000 series of calibers had arrived, becoming the standard issue for Rolex until the present day. The Cal. 1530, in its role as test pilot for its host of new upgrades, sat inside two models in the Rolex rangel. One, the most recognizable form in the horology world, and the other, a simple yet underappreciated classic. The world’s favorite dive watch started life in 1954, just three years before the launch of the Cal. 1530. They introduced it into the first reference of the Submariner’s third generation, the ref. 5508, succeeding the previous A260 caliber, but it took the debut of the ref. 5512 in 1959 before the Sub became the genre-defining piece we know it as today. It was the 5512 that introduced crown guards to the tough tool watch, as well as a steel bezel. Along with its sister piece, they released ref. 5513 a few years later in 1962. This represented the last of the truly ‘pure’ Submariners among collectors. These were the final vintage references before the date feature and its controversial Cyclops lens made an appearance in 1965 with the ref. 1608. Outwardly, the 5512 and 5513 look almost identical. In its earliest days, the 5512 contained the non-chronometer rated Cal. 1530 and had a corresponding two lines of text on its dial. They upgraded it to the more advanced and COSC recognized Cal. 1560 further along in its run. The resulting four lines of text, with the addition of ‘Superlative Chronometer, Officially Certified’, is the only convenient way of telling the two references apart. Rolex never meant for the 5513 for chronometer status. It was, therefore, always the cheaper option because of it. 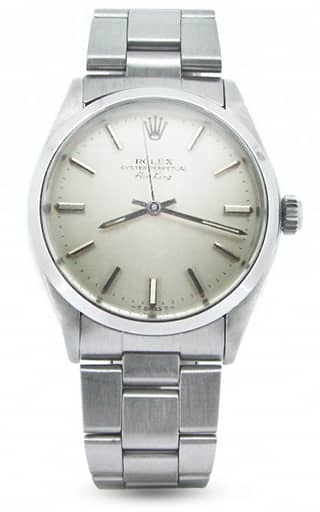 Initially carrying the same 1530, they swapped it for Rolex Caliber 1520 in the mid sixties. Both watches went on to have incredibly successful runs. They discontinued ref. 5512 in 1978, not before it had become the preferred choice of a certain Steve McQueen, while the ref. 5513 lasted right up until 1989. With their timeless, uncluttered design and robust steel construction, the last of the no-date Subs are high on the wish list of many Rolex enthusiasts.